The volume of gas increases with altitude (reducing pressure) in keeping with Boyle’s Law. Boyle’s law states: The volume of a gas is inversely proportional to pressure (At a constant temperature). Gas is partially trapped in various body cavities such as the middle ear. As an aircraft climbs or descends, there is a difference in pressure between the cabin altitude and the air in the body cavity. Clearly, Barotrauma may effect pilot or passenger in both pressurised aircraft with a cabin altitude of 8000 feet (for example), and private pilots flying West at 6000 feet (or lower). Barotrauma affecting the middle ear is Otic Barotrauma and the most common type of Barotrauma. Air at an altitude of 8000 feet is around 30% greater in volume than the same amount of air at sea level. During ascent, the pressure differential across the ear drum causes the middle ear gas to expand, and vice-versa during descent. Without equalisation of pressure between the middle ear and the cabin air pressure, the ear drums stretches and causes pain. This may occur when the pilot is travelling with a cold, has eustachian tube dysfunction, or is not performing / unable to perform the Valsalva manoeuvre. Barotrauma is more common during descent. Otic barotrauma is graded according to its severity – the most mild form is pain without any signs, then earache with a red ear drum, followed by earache with bleeding on the eardrum, and finally perforation of the eardrum when the pain is immediately alleviated. Most perforations heal fine within six weeks. How may ear Barotrauma be prevented? 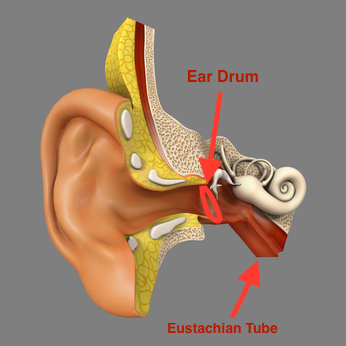 The eustachian tube connects the middle ear to the back of the upper respiratory tract (Nasopharynx). The tube has a one-way valve that allows the middle ear to ventilate. During ascent, the air travels the “right way” across the valve – from the middle ear to the nasopharynx. The middle ear automatically ventilates during ascent – no action by passenger or pilot is required. Valsalva: Blow air forcibly against the closed nostrils to force air up the eustachian tube. At sea level, air pressure is around 760mmHg, and at 8,000 feet the air pressure is 570mmHg (25% less) – a pressure difference of 190mmHg. The valsalva manoeuvre will only work up to a maximum pressure differential of around 110mmHg. So it will take at least two well-spaced Valsalva manoeuvres to equalise the pressure during descent. Don’t leave Valsalva too late or it won’t work. In a pressurised aircraft, the rate of reduction in aircraft pressurisation. The cabin altitude may reduce by up to 500 fpm without discomfort in most people. Rate of change of cabin altitude during descent is lower than the rate of pressure change during climb – partly to help reduce the risk of Barotrauma that is more common during descent. Someone with a cold will probably not be able to equalise the pressures and is at increased risk of Otic Barotrauma. Pilots learn at an early stage of their flying training not to fly with a cold. The valsalva manoeuvre will only work up to a maximum pressure differential of around 110mmHg which works out as roughly a change in (cabin) altitude of 4000 feet – don’t leave Valsalva too late or it won’t work. What are the other types of Barotrauma? Sinuses where the air may not be able to equalise during a cold or Sinusitis. Sinus Barotrauma is most likely to effect the larger sinuses that have a relative narrow opening into the nasopharynx – The Frontal & Maxillary Sinuses. Barotrauma of the frontal sinuses causes a headache above and behind the eyes, whilst barotrauma of the Maxillary sinuses cause pain in the cheeks which may be felt as dental pain. Gastrointestinal Tract: Air also expands on ascent which may cause belching, flatulence, or discomfort – even pain. Teeth: Small amounts of air may be trapped under fillings or cavities. Expansion of air during ascent will cause severe toothache that may be incapacitating. More commonly, pain felt in the dental area is from the sinuses.